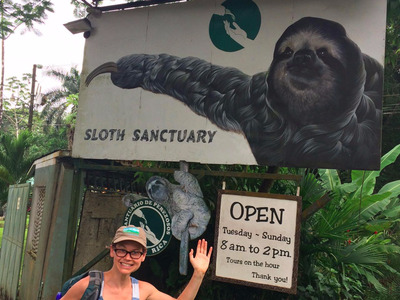 No trip to Costa Rica is complete without a visit to the country’s only Sloth Sanctuary, a place where abandoned baby sloths and those with physical disabilities are rescued, rehabilitated, and given another chance to thrive. In other words, it’s a place where dreams come true. 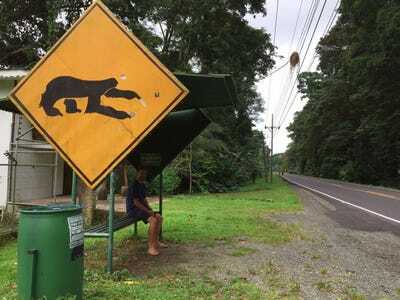 Costa Rica is famous for lots of things. 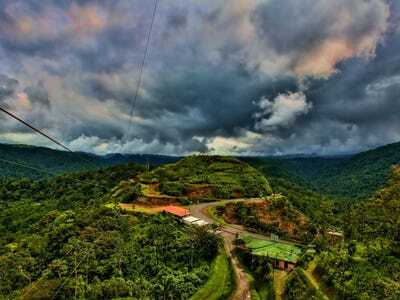 Zip-lines. Coffee. 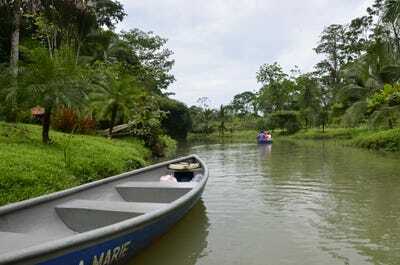 Environmental tourism. I was going for the sloths. I wanted to spend a day with my spirit animal, who's infamous for moving so slowly it looks like it was recorded in slow-motion. 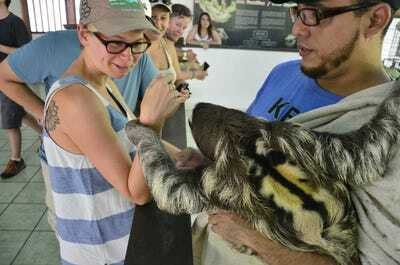 So naturally, I carved out a full 24 hours to spend in the country's only Sloth Sanctuary (formerly known as the Aviarios del Caribe). 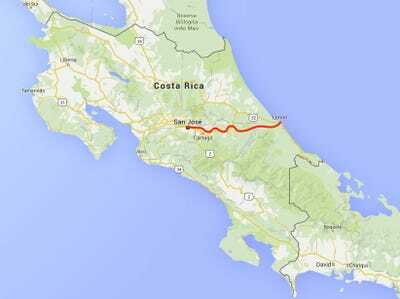 If you're starting in the capital city of San Jose, getting to the sanctuary, which is located on the country's east coast near the city of Limon, is a bit of a trek. 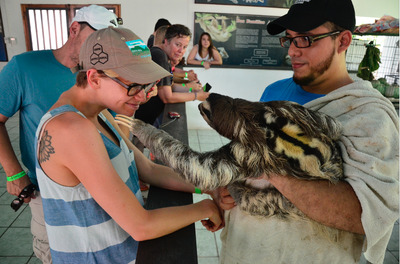 It's a 3.5-hour drive from San Jose to the Sloth Sanctuary. Lucky for me, I'd been travelling up and down the country's coast for a few days by the time I planned to stop by the sanctuary. 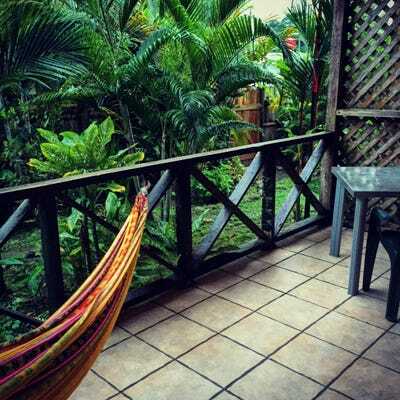 From my Airbnb in the neighbourhood of Cahuita, all I had to do was walk to the local bus depot. 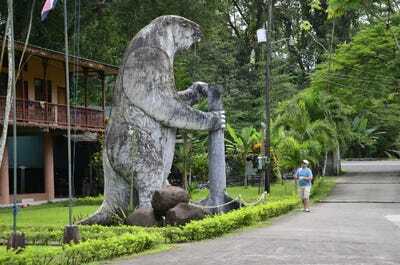 Inside the gates, the pathway widened into a large driveway, where I was greeted by this giant stone fellow. Don't worry, this creature isn't a sloth. 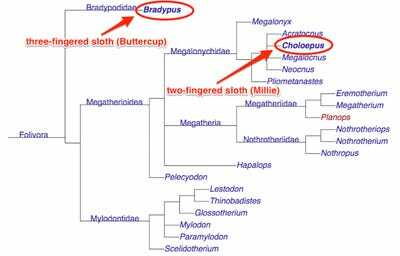 It's a sloth ancestor -- an elephant-sized ground sloth belonging to a genus called Megatherium americanum. The last of these creatures died out some 11,000 years ago. 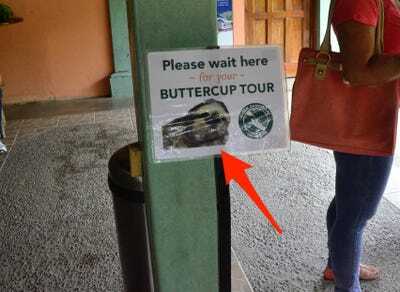 I'd signed up for the Buttercup Tour, named after its very first resident: Buttercup, whom the sanctuary acquired in 1992. 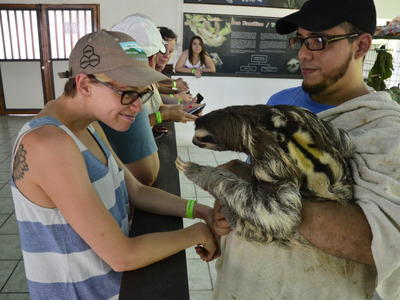 Back then, the story goes, a young girl saw a car hit and kill a sloth, leaving its baby to fend for itself. Me, Duggar, and our tour guide Marcos. 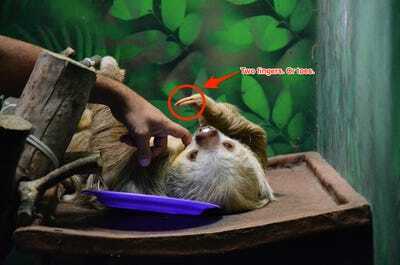 Duggar is a specific kind of three-toed sloth known as a brown-throated three-fingered sloth, or Bradypus variegatus. 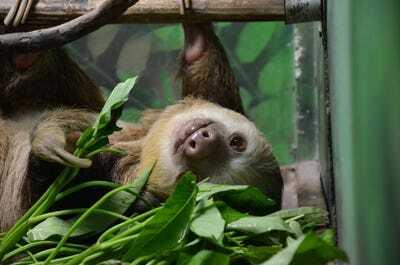 His species is the most common sloth species and thrives in Central and South America. 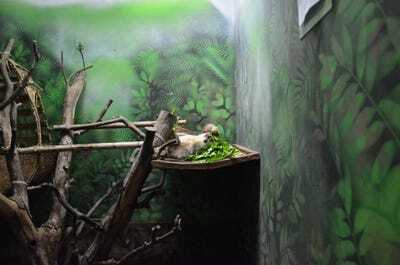 Brown-throated three-fingered sloths can be identified by the brightly coloured patterns on their backs. 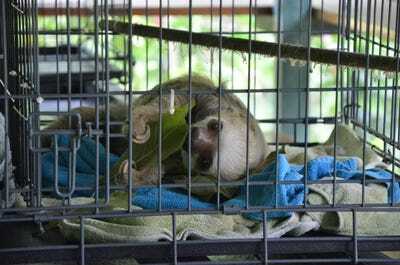 One of the sanctuary's residents, Toyota, was brought to the sanctuary after being badly burned while climbing an electric wire (a frequent source of injury for sloths in Costa Rica). 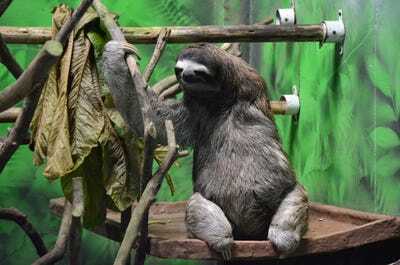 Although he lost the forearm which suffered the brunt of the injury, Toyota was nursed back to health, and now hangs out in one of the sloth habitats near Millie. Lunchtime rolled around as we were finishing up our tour. 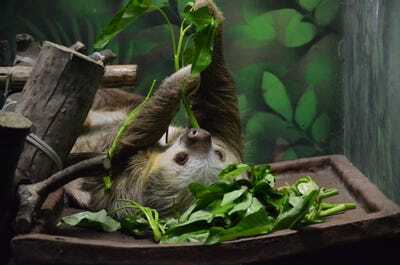 Here's Millie enjoying a meal of tree leaves, which make up the majority of her diet. 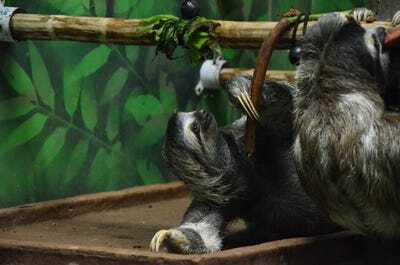 Like other Hoffman's two-fingered sloths, she also noshes on the occasional fruit or flower. Soon, it was time for us to go. As we said our goodbyes, Millie kept chewing. 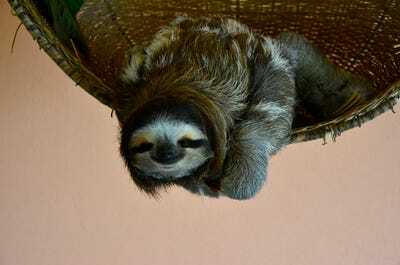 And here's another three-fingered sloth like Buttercup hanging out.